"It is a soft, beautiful book. Even the texture of the cover hints at the clouds you’ll find inside. The book itself read more to me like a memoir perhaps, than a novel. There was no overarching narrative arc to the book beyond the arcs present in the individual chapters. What there is throughout is a constant, maintained feeling of earnestness, of searching. The story moves like memories move: blurring, doubling back, building upon one another. And Bosworth masterfully plays this up with quite possibly one my favorite formal plays I’ve seen in a book." Such a great surprise to come home to. 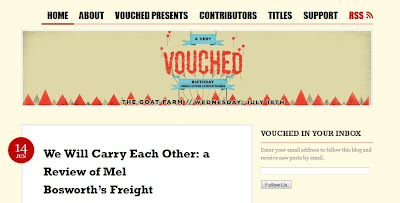 Thanks to Christopher Newgent & the Vouched team. Read Christopher's review HERE.